The Cove Church in Mooresville, N.C., is another example of a worship facility that's made the move to HD. 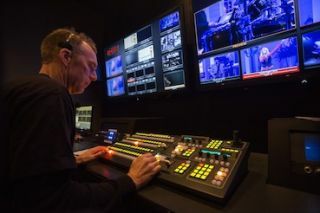 Cove Church is now using a Broadcast Pix Granite 5000 2 M/E Video Control Center to produce image magnification (I-MAG) for its congregation during services, as well as simultaneously stream its services live on the Web and share the live video feed with three campuses across the state. The church began using its new system in mid-October. Attendance at the main campus in Mooresville, a suburb of Charlotte, averages 3,800 over its four weekend services, with another 900 attendees spread across its North Carolina campuses in Newton, Statesville, and Cornelius. When the church’s aging SD video system needed to be replaced, church officials decided to transition to a full HD production workflow. “We wanted to give our campuses the absolute best quality image,” said Greg Antisdel, director of production. The Cove Church purchased its Granite 5000 from ClarkPowell in Charlotte, NC, but designed and installed its own HD infrastructure. The upgraded control room is housed backstage in a room large enough to accommodate up to eight volunteer production team members. Antisdel said the video production team gives people the opportunity to serve the church and help share its message. The Fluent Clip Store is used for a countdown video before services and a message intro, as well as “life story” videos that are sometimes integrated into services. Antisdel said Fluent Macros were designed for some tasks, so a volunteer TD—who operates the system maybe once a month—does not need to be particularly skilled at switching to get professional results. Fluent-View, the built-in, customizable multi-viewer, populates all sources on two Sharp 70-inch LEDs in the control room.